Anamaría Crowe Serrano’s one columbus leap is a poetic tour de force on the gestation of Columbus’ 1492 step from the harbour town of Palos de la Frontera to the new world. Her poetry stimulates with linguistic inventiveness and a precise and exhilarating vocabulary that carries the reader far beyond the brooding narrative. It ignites and sparkles on every page with the full range of an energetic and exciting poet on display. This is contemporary poetry at its best. David Caddy, editor of Tears in the Fence. Words in Anamaría Crowe Serrano’s one columbus leap have texture that travel un- der the skin and in between worlds. Their leap is elliptical and their eyes are restless in collecting experience. Things are half-revealed and mystery mists the scenery. There is an insatiable hunger for natural phenomena and a calling for the accuracy of words. Words dance, words create families, alliterations, lists, shapes, labyrinths. Then for a moment: immobility. Whatever is experienced travels deep, establishing new ground. Change is slow and yet again it happens rapidly. Your senses will be initiated here and unexpected occurrences will put you in a spell. This collection is thoroughly recommended. Nina Karacosta, author of Previous Vertigos. 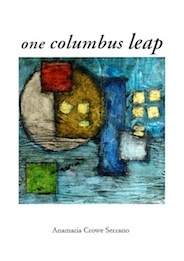 Weaving poetry and short prose, one columbus leap fascinates as it evokes a human being progressing toward a “never” that “awaits”. At once vividly precise and full of unsettling metaphorical resonance, Anamaría Crowe Serrano’s sequence sails be- yond the year 1492 and the discoverer of the New World; it lands amid startling natural profusion, but also illness and lucre: it encounters us. John Taylor, author of Into the Heart of European Poetry.